So I started playing Klonoa for the Wii the other night. What a charming, charming game. I missed this title the first time around, as I never owned a PlayStation. (I was also too busy making movies in the mid-90s to play games. Sigh.) What I especially love about it is that it is a 2D platformer firmly grounded in a 3D world. When the environments rotate, you can see into the distance, noticing places or objects that you would like to reach. In a traditional 2D platformer, the edges of the screen naturally limit your ability to do this. But in Klonoa, you have the illusion of exploring a huge 3D world, firmly grounded in a design that really only lets you move left and right. It's a brilliant mechanic that makes the game feel very modern, even if it is a decade or so old. Bonus: if you go to the official site, you can listen to a good 15 minutes or so of the soundtrack, which is really excellent. 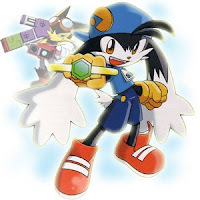 As reported by 1up and other online sources, the controls in Klonoa are really tight and the game overall feels like a standout representative of what is today a withering genre. Also, I am playing the game with the "gibberish" language and not with the new English voiceover. The presentation is very cute, very Japanese. Recommended! In other game news, I finally finished Bioshock last night, only two years too late. Maybe some day I will post my thoughts on that game, as well as Half-Life 2, another critically-adored shooter. Both games are excellent in their own right, but I cannot help but notice some annoying things about each title that prevents me from completely gushing over them. Again, the Schwartz Theory of High Expectations Media Consumption rears its ugly head; I went into both titles with unrealistically high expectations. There was no way they were going to be met. Oh, and I am also this close to finishing Dragon Quest V on the DS.